With plenty of space and comfort for family and friends, our home offers hardwood floors, granite countertops, vaulted ceilings, large open main floor/great room, large dining area, gas-log fireplace, off-street parking, ski and gear storage area, private setting. Large deck with grill, table/chairs, gorgeous sunset views. Bar area off of dining room with wine/beverage refrigerator, foosball table in loft area. 5BR total plus loft. Layout: Lower level BR1: full, BR2: queen, BR3: full. Main level BR: queen. Loft: queen, upper level BR: 2 sets twin bunks, plus queen sleeper sofa in LR. Sleeps 16 comfortably. 3.5 baths. Linens provided. Washer/dryer on site, 43-inch plasma television with HDTV, wi-fi, free local and long-distance calls. 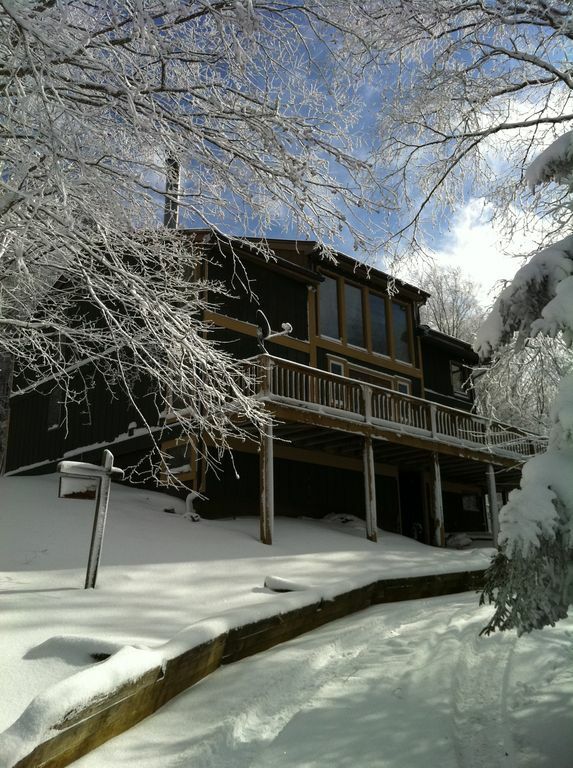 Approximately 200yd walk to Cupp Run ski slope, and free shuttle service from front door to Snowshoe Village (approx. 1.5 mi away) or Silver Creek ski area. Avoid the hassle of driving and finding parking on the mountaintop - the shuttle runs late for easy transportation home from skiing and tubing, or from a night out in the village. Shuttle runs for summer season, too. Non-smoking home. Ample parking, with room for 3-4 vehicles in our newly-widened driveway and a pull-off space for 2 to 3 vehicles directly across the road from the bottom of the driveway. Driveway and roadways are plowed regularly, but 4 wheel drive is strongly recommended in winter. We love West Virginia and always dreamed of owning a home in Snowshoe. We purchased this home, which had been neglected and was in desperate need of TLC, and worked to renovate it ourselves, imagining a place to make fun memories with friends and family, particularly as our two young boys grow up. We hope that you, our guest, find it as comfortable and inviting as we do, and that you make wonderful mountain memories here, too. large open main floor allows everyone to be part of the action; or send the younger ones to the loft for their own space with Netflix movie access and foosball table. Full baths on each of 3 levels, near bedrooms. Additional half-bath located on main level. fully equipped with cookware, dishes, utensils, etc. We had a great time here. The kitchen was well stocked to cook for our large group. We had plenty of space to hang out. The on-call shuttle was convenient, and the walk to Cupp run was another easy option to get to the slopes. The owner was flexible and responsive. We would stay here again. Perfect Vacation with the Family! The home was perfect for our big group and the location next to Cup Run was perfect and we never waited more than 10 minutes for our bus all week👍🏾 Great time! and close to the slopes. We may come again. Perfect location for a weekend of mountain biking with friends! Had a great time staying at this cabin. Plenty of beds for our group of friends. Great kitchen for dinner prep and a wonderful patio for sunset views. Will stay here again! This place is beautiful. Sits on the Western territories side of the mountain, with a beautiful view and walking distance to the slopes. The cabin has everything we needed for 9 friends to enjoy a ski weekend. Highly recommend this place. Located on West Ridge Road at the top of Snowshoe Mountain, within Snowshoe Resort, a premier 4 season resort. Approximately 200 yards from Cupp Run ski slope (black diamond). Approximately 1.5 miles to Snowshoe Village and restaurants, shopping and resort amenities. Free shuttle service transportation from home to Village, Silver Creek Resort area and additional skiing. The Raven Golf Course is located at the base of the mountain, approximately 5 miles. Cancellations or partial-stays not refunded for instances such as weather, illness, or injury. No refunds if cancellation is made after final payment (45 days prior to arrival.) Cancellations before this 45-day period will be refunded minus 10% of initial payment.